As you can imagine, powerful special interests like the NRA Lobby are already mobilizing to undermine our efforts to ratify the Arms Trade Treaty in the United States. So it’s critical that we see this through. When the treaty opens for signatures by member states on June 3, we want President Obama to be the first in line. Stay tuned for our more our continued fight. We won’t stop until families worldwide are protected from armed violence. This entry was posted in Amnesty Members, Military, Police and Arms, United Nations and tagged Arms Trade Treaty, golden rule, human rights violations, iran, North Korea, NRA, President Barack Obama, Syria, U.S. Congress, UN conference, United Nations, weapons regulation by admin. Bookmark the permalink. You have surrendered power to foreign entities who are not interested in your rhetoric. You have set precedence to abolish constitutional rights of any kind. You have just created a billion dollar criminal market that will be used to fund political agendas for organized crime to enter deeper into government. You have paved the way for dictatorships to flourish and oppress people world wide. It was always an international crime to acquire or transfer arms in situations of genocide and wars or armed conquest. Sadly a libtard moron element once again allowed themselves to be used and exploited in furtherance of an international criminal element. The treaty was merely a ploy. Amnesty international serves a noble cause in general. Now they are serving communism which oppresses people. I don't understand why. Much like stricter gun legislation in the US, it won't solve anything. About all it'll do is make a few people feel good about themselves for "making a difference" when they've really done nothing of the sort. Sad to say, but it's the truth. But if it helps you sleep at night, congrats. I guess. @Some Guy – The Arms Trade Treaty does not affect gun legislation in the US. This is about limiting arms transfers to regimes that commit terrible human rights abuses. It would affect gun legislation in the US. In the short term this may help with the regimes, but more than likely not. In the long run this is going to be devastating to human rights. Bravo for campaigning through the long, hard struggle to make human beings more humane. Those who are quick to deny your efforts and noble aims haven't the ethics or the courage to work for a bettter world. 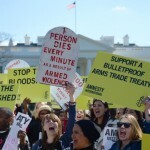 Arms Trade treaty opposed by N. Korea, Iran and Syria – anyone want to join those three? There are apparently no federal statistics on weapons used in crimes, only state by state. I am very happy to hear that the treaty has been adopted and I hope to see it signed and ratified as soon as possible. Far too many people often in poorer developing countries die as a result of sales of arms mostly coming from the two biggest arms dealers in the world – the USA and the UK. We are talking about completely innocent men, women and children dying for no good reason. So I congratulate you A.I. 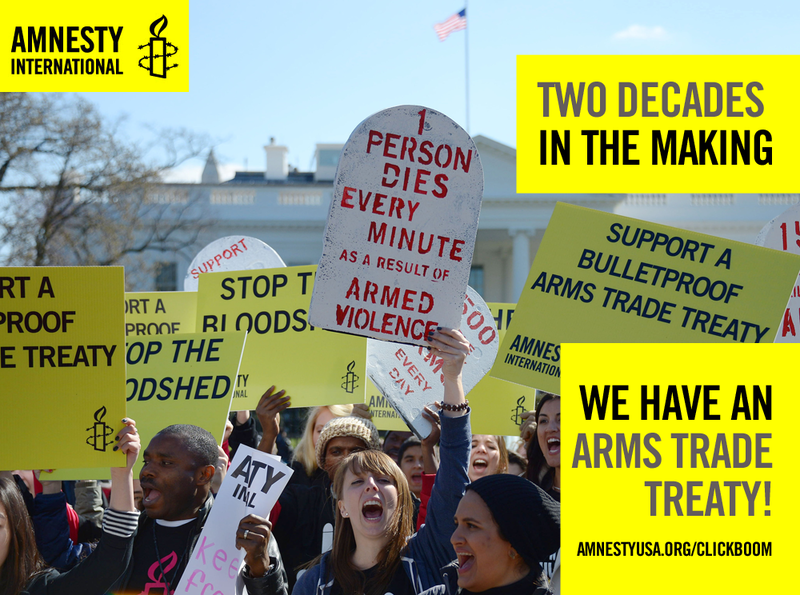 for your efforts in seeing this arms treaty adopted and I hope it will reduce the number of unnecessary deaths. I disagree with Bonaparte as I think that the USA in signing this treaty will be setting an example to other countries. How can we possibly expect other poorer countries to control arms sales if two of the richest countries in the world dont accept that responsibility? ARMS TREATY AGAINST WHO? THE DICTATORS OF COUNTRIES OR THE REVOLUTIONISTS ATTEMPTING TO OUST THE DICTATORS? Great news, Amnesty International!!! Yes, there's still loads of work ahead…but at least we've started. Nothing does more harm than inertia or indifference. Finally people who get it: firearms lead to more violence and more deaths. They shouldn't be easy to get and not anyone should have one!